When you need a really big sport ute to haul family, co-workers and friends, not to mention having some hefty towing grunt on tap, GMC has the redesigned Yukon XL full-size body-on-frame SUV ready for 2015. The next-gen 7-to-9-passenger Yukon XL lineup will look different and pack more power and features, and at last it dispenses with the pesky removable third-row seat. The new fold-into-the-floor third row means no more wrestling that varmint in and out of your Yukon XL when added cargo area is needed. The downside to this is that total cargo area declines from what was a roomy 137 cubic feet with the third row removed to a still respectable 121 total cubic feet with this latest folding iteration. A further upside, though, are the several square inches of extra legroom comforting second- and third-row adult-size passengers. Again, this newly reworked behemoth is expected to be available in 3 trims, the base SLE, the up-featured SLT and the luxury-toting Denali. This stretched-out Yukon will also retain its 16 inches of added overall length (202.2 inches) and its 14 inches of extra wheelbase (116 inches) over its less garage-challenged siblings. Word is that this not-your-father’s Yukon XL will sport a new grille and full-width bumper for 2015, as well as toting the newly released direct-injected (DI) EcoTec3 engines in all its iterations. Additionally, cabin accents and upholstery get a refurbishing for this latest model year, while a new all-aluminum hood and aluminum liftgate panels are touted to shed a little of this monster’s heft. Alas, some new techno-goodies, like an 8-inch touchscreen display, a power liftgate, a new adaptive suspension system for the Yukon Denali XL, and a slew of updated safety bling, including an airbag centered between the driver and front passenger, put much of that weight back. In any case, the capable Yukon XL, in both the entry-level SLE and the penultimate SLT guise, carries the aforementioned up-powered DI 5.3-liter V8 that’s been tweaked with cylinder-shutdown capability for a bit more fuel efficiency. The traditional 6-speed shiftable automatic transmission again manages the reworked V8 to put out 355 hp and 383 lb-ft of torque. Mileage figures are not yet available, but this big ute is expected to tow at least 8,300 pounds when properly equipped. Of course, all non-Denali Yukon XLs are delivered with standard rear-wheel drive (RWD), but terrain-taming on-demand 4-wheel drive (4WD) with a 2-speed transfer case will once again be available. Moving up to the plush Denali XL, expect the standard 6.2-liter V8 engine to get the same added perks as its smaller cousin, with the 6-speed shiftable automatic now massaging 420 hp and 460 lb-ft of torque. Again no towing or mileage figures are available, but instead of 4WD, this princely people-hauler, again offered with standard RWD, can be equipped with full-time all-wheel drive (AWD) suitable for snowy highways. Standard appearance amenities gracing the modernized 2015 Yukon XL SLE should remain 17-inch alloy wheels, side steps, a trailer hitch and wiring, and, new this year, a power liftgate. Inside, look for upgraded cloth upholstery and accent materials, as well as power-adjustable front seats and full power accessories, including power-adjustable pedals. Cruise control is standard once more, with optional active cruise control with forward-collision alerts among the new safety offerings. Tilt-wheel steering, meantime, as well as rear parking sensors and a rear-view camera are all bolstered by Bluetooth-interfaced OnStar technology, while tri-zone climate control is complemented by a single-CD player, 9 Bose Premium speakers and satellite radio. The up-featured Yukon XL SLT adds standard leather upholstery, heated front seats, a heated steering wheel, a remote garage door opener and memory for driver's settings, while the XL Denali boasts such extras as 20-inch alloy wheels, unique (and new-for-2015) interior accents, a 10-speaker Surround Sound system, added cabin noise insulation and the already-mentioned adaptive suspension upgrades. Options, meantime, should again include, depending on the trim selected, a power sunroof, hard-drive-based navigation, upgraded and upsized wheels and exterior chrome pieces, and updated rear-seat DVD entertainment. Also new for this year is an improved cargo-management system, while a number of optional seating configurations return from 2014. Finally, a significant upgrade for all 2015 Yukon XL trims is a new center airbag to complement the front side-mounted airbags and 3-row head airbags returning from the previous generation. The XL Denali additionally sports standard high-intensity-discharge (HID) headlights and turn-signal-integrated mirrors, as well as blind-spot and lane-departure alerts that are optional in lower trims. Of course, the usual safety items aboard all XL trims, like 4-wheel antilock brakes (ABS), traction and stability control, front fog/driving lights and a post-collision safety system remain bolstered by standard OnStar emergency communications and alerts. 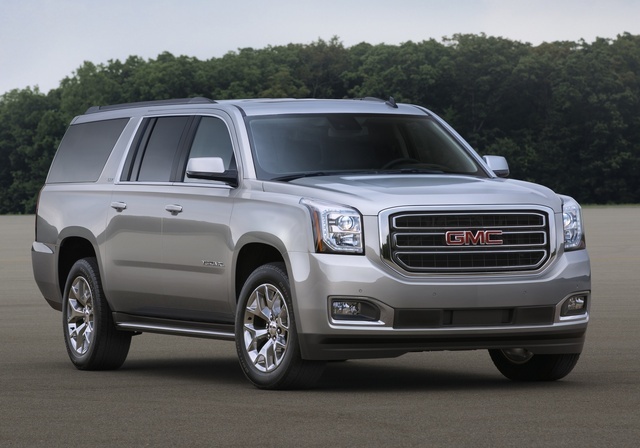 What's your take on the 2015 GMC Yukon XL? Users ranked 2015 GMC Yukon XL against other cars which they drove/owned. Each ranking was based on 9 categories. Here is the summary of top rankings. 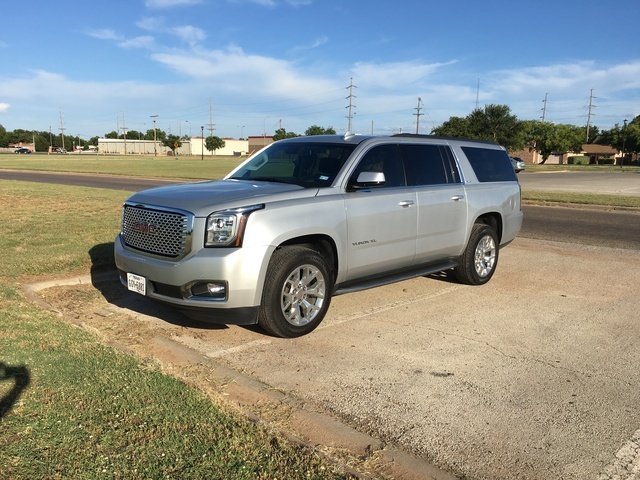 Have you driven a 2015 GMC Yukon XL? went from 18 inch rims to 20 inch with 275 55 on my 2015 yukon xl getting a rear thump periodically when coming to a full stop. 2015 Yukon XL Passenger Brake Light. My passenger side brake light doesnt work but the blinker does. I replaced the light assembly and still have the same issue. Any ideas what the issue would be? My washer fluid runs out from bottom of car by rear wheel. How do I get to the line and repair? I’m looking to trade my black bench seat from a 2015 Yukon XL for captain seats. Please inquire if interested.